There is nothing I love more than having Joe fire up the grill because it means less work for me, but also because he can cook just about anything on the grill to perfection. 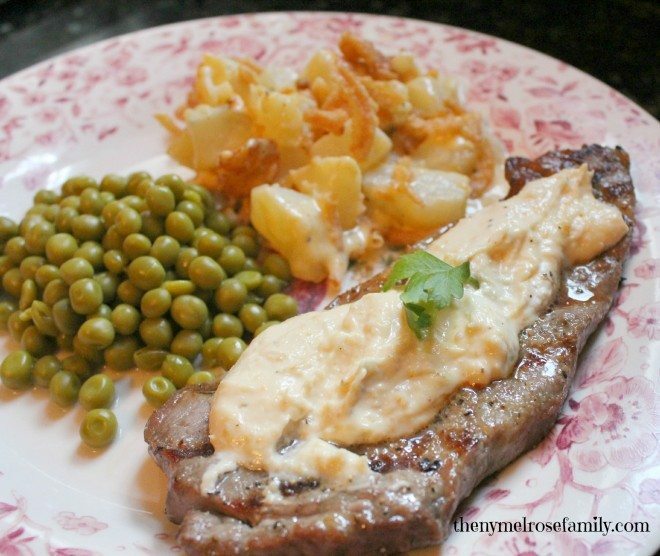 I love adding a little extra flavor and this Horseradish Steak Cream Sauce definitely kicks a punch. The sauce takes minutes to whip up and would work on steak, pork and even ham. Let’s just say it’s yummilicious. I paired the Horseradish Steak Cream Sauce with my Cheesy Potato Casserole and a vegetable. Joe and I were both surprised how the horseradish cream sauce gave the steak an almost expensive appeal. The reason I bring this up is because Joe says that I’m terrible at picking out steaks. The funny part about this is that I will openly admit that I don’t have a clue. If you remember from previous posts, I didn’t eat meat before Joe and I started dating. The first dinner that Joe ever cooked for me was a steak dinner where he sent me to the store to pick out a steak. I found a fabulously nice lady at the store and explained my predicament. She whole-heartily helped me pick up a steak for that dinner and wished me luck. I’m not quite sure, but I’m pretty sure that lady thought I was hopeless and didn’t have a chance with my now husband. This sauce can be easily adjusted to the number of people that you are serving. A decadent horseradish cream sauce that works well on top of steak, pork or ham. Sounds delicious. Love horseradish sauce with steak. Pinned it! I love horseradish ANYTHING! We go to this nice steak restaurant in Indianapolis and they have the best shrimp cocktail ever. The sauce is sooooo horseradishy. It clears out your sinuses. I’ll totally be making this!! It’s so funny because for some reason I totally thought of you when I was writing this post. My husband loves horseradish sauce. I think I’ll need to make this for him. And then maybe he’ll turn a blind eye to all my Pick Your Plum purchases. We love any kind of horseradish sauce … and that recipe sounds like a great combination! This is making my mouth water Jenny! Thanks for sharing it at Monday Funday! I love horseradish with my roasts, but I’ve never thought to use it on steak! This sounds so good, I’m pinning this so I can try it on more than just beef. Thanks, Jenny! Thanks so much Debbie. I got the idea for it because my brother-in-law used something similar on a pork roast for Easter. It is amazing on steak though. I love horseradish sauces. This looks so delicious. Thank you for sharing this recipe. Thanks so much Susan. I aim to please. I have a fabulous Cranberry & Horseradish sauce that I use around the holidays on muffins and crackers too. I can’t get enough horseradish. Thanks so much for pinning Brenda. certainly like what you are saying annd the way in which you say it.